This volume is mainly concerned with two conceptual spheres of experience, the journey and knowledge, and how they interconnect in ancient Greco-Roman representations and texts. It is a collection of papers presented at the International Conference ‘Paths of Knowledge in Antiquity’ that was hosted in Berlin in December 2016. 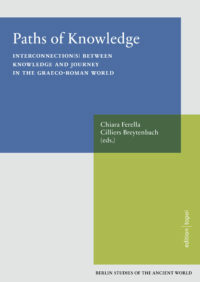 The papers provide case-studies from the Greco-Roman world that exemplify the interconnection between the two conceptual domains from two perspectives. First, focusing on actual journeys and concrete paths aimed at knowledge acquisition, such as literary quest stories, nostoi, training paths, historical voyages, and the like. Second, using metaphorical mapping, in which elements included in the conceptual domain of knowledge are depicted as connected figuratively to the domain of the journey. However, it turns out that these two approaches, despite being useful starting points for textual analysis, are often so deeply intertwined with one another that it is difficult to separate them. Actual journeys often become metaphors for the path towards knowledge acquisition. In turn, journey metaphors are essential for depicting unfamiliar and abstract physical processes and are, therefore, used in theoretical constructions, as it were, literally. Finally, the two directions also divide to reveal a third perspective: the metaphorical path to knowledge becomes the pathway through the text, namely the path on which a reader and author set out upon together. The contributions of this volume clearly show to what extent the macro-theme of the journey is essential for the narrative of knowledge acquisition.